DH and I had a quiet New Year's Eve. We stayed home as usual. With the kids all living elsewhere, why go out? We checked the TV schedule and were pleased to find a Great Performances show on PBS. It was opening night at Carnegie Hall 2006. When we turned it on, we were delighted to see our own Cleveland Orchestra with Franz Welser-Most conducting. We switched away to watch the ball fall in New York, but with Tivo, we didn't miss a note. I finished knitting another TNNA swatch from Soxx Appeal by Knit One Crochet Two. I found this simple lace pattern in one of my German books. It's a 6 stitch repeat. Row 1 :k3, ssk, k1, k2tog. Rows 2-4 Knit. This morning I was running around the house getting the yarn and needles for the last TNNA swatch. I also got the Noro I received as a surprise Christmas gift from one of my local yarn stores. This will become a Fidget scarf for my DIL Peg. She has a birthday in a few weeks and we will see her again Sunday for our monthly breakfast. After getting the whole Fidget pattern, I realized that I would need to double the yarn, so went stash diving for something appropriate. Found it! Why I needed to do this before breakfa st, I don't know, but now I'm organized for the day. The last TNNA swatch is from Great Adirondack Yarn Company, Chinchilla in the Nantucket Blue colorway. I've adapted the Multidirectional Diagonal Scarf pattern for it. This is a yarn where stitch definition is nil, but colors show well in the multidirectional pattern. 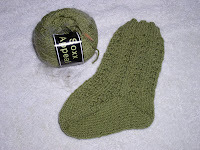 On the needles, a pair of socks for DH, dark green Special Blauband. I have 5" of cuff in 2x2 rib. Not very exciting. 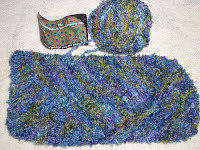 I am about to start a Fidget scarf for DDIL Peg. I made one for myself earlier this year and she admired it. It will make a good birthday present later this month. We have the first snow storm of the year, the second of this winter. When I went out before dinner to walk the dog, it was so beautiful. It was lightly snowing, not windy, and so quiet. We had 2-3" at that point. It's a little noisier right now. The snowblowers are out.